response to the invitation by European Union foreign policy chief Javier Solana for talks with the United States, Britain, France, Germany, Russia and China." Well, if we need to save money, guess we can economize on the Secretary of State as well as the Press Secretary. Looks like Javier Solana can do the speaking for everybody but himself. He's got Cristina Gallach for that job! Well, that moon's looking sort of pink again. Oh, and about the upcoming radio programs. The Macho Response's "Crack Emcee", the atheist anti-New Ager had an emergency and had to cancel Tuesday. He is rescheduled for Tuesday, April 28th. I will be at a bar association meeting Thursday night, but I've replaced me with something better -- Sarah Leslie has some new and pivotal research on the Paul Temple - Willis Harman research, including some evidences of Paul N. Temple (co-founder and chief financier of Institute of Noetic Sciences not to mention Doug Coe's Prayer Breakfast network -- "The Family" / "Fellowship Foundation" with the "Emergent Church Movement." Sarah will host my radio program Thursday night and discuss her latest research. "International Foundation" aka "The Family"
And they, IONS, have had ecstatic things to say about Wayne Peterson and his relationship with Benjamin Creme and the "Emergence" of Maitreya / Betraya 'The Christ.' Fancy that: The Emergent Church and "The Emergence of the [er, ah] 'Christ'" Is Paul Temple hedging his bets not sure who will win the eternal wars, or is he (more likely) financing the subversion of Christianity? 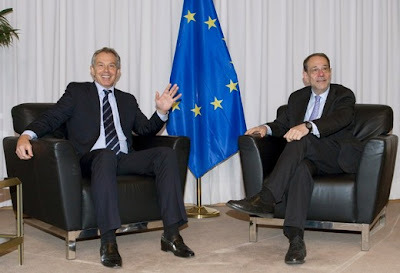 Watching the two European gentlemen Tony Blair and Javier Solana is certainly not boring. Tony Blair has had incredible adventures lately. He also is making a lot of money! A purported Catholic convert, he belies his sincerity by telling Pope Benedict XVI he needs to evolve his views on homosexuality. Tony Blair has lots of apparent influence with Evangelicals as well. He overshadowed American President Barack Obama at the January Presidential Prayer Breakfast as its keynote speaker. Given Paul Temple's level of financial participation with this group as well as his Institute of Noetic Sciences, that probably means that at least some of Tony Blair's growing bank accounts came from Mr. Temple's largesse as well. Has Tony Blair been "born again" or had a genuine Catholic conversion? Only God knows his heart for real, but his present syncretistic orations suggest that his real and lasting conversion may have been his Mexican New Age rebirthing one. You may read one account of that by clicking here. "Actually, we need an attitude of mind where rethinking and the concept of evolving attitudes becomes part of the discipline with which you approach your religious faith"
There has been reported friction in the past between Tony Blair and Javier Solana. It should be most interesting to watch this one play out. Mr. High Profile vs. Mr. Fly Just Under Everybody's Radar. Dr. Stanley Monteith called me today to ask if I would like to be a guest on his Radio Liberty program tomorrow afternoon at 7 p.m. Eastern time, 4 p.m. Pacific time. Of course, I said, "yes." I always enjoy working with "Dr. Stan." But I had a dilemma. Immdiately after hanging up from that program, I have my own radio program to do on THEMICROEFFECT.COM. So, the solution is easy. Dr. Stan will warm me up on his program and then he has graciously agreed to immediately thereafter be the guest on mine. So we will have two hours together back to back with little time to rest the voice. I had a nice talk with Dr. Grady McMurtry today. He is a brand new grandfather. His daughter and grandson (9 lbs, 11 oz.) is doing well! He will be a repeat guest on my radio program this coming June 16th. I've found myself extraordinarily depressed over the death of one of my very favorite on line blogging allies -- Carrie Tomko. She had a literal goldmine of research and resources. I've spent every spare minute the last few days archiving all of her site I could catch. It took 30 Adobe pdf file pages of approximately 200 pages each and that was after I eliminated unnecessary pages. God took Herb Peters home two years ago and now he has taken Carrie Tomko. I confess I miss them both so very much and my prayers are with both their families. If I didn't have so much to do at the office I would to get to her Cleveland area funeral on April 14th. Law, as they accurately say, "is a jealous mistress" and I am unable to see my way clear to get away. I also need to find time to get to my home town of Fort Wayne, Indiana as well as see family in western Michigan. Pray for me. I am going to seek Carrie's family's permission to post her archives in my on line repository -- the same place you may download my two books and other relevant material and presentations. It is to the right as "Presentations for downloading" link or you may click here. Lee Penn has given me the great news that I might very soon be able to make his entire extremely important book, FALSE DAWN, similarly available for downloading. Of course, it is good to have the hard copy as well which you can obtain from Lee's own websites or from Amazon.com. Pray for me. Pray for Carrie's family! It is with deep sadness that I announce that God has called one of our very most diligent and productive co-laborers home. Monday, April 6th, Carrie Tomko died peaceably with her family at her side. Her funeral is scheduled for April 14th in Ohio. I will announce more particulars here as I learn of the arrangement. There is a message from her family at Carrie's blogspot, STILL RUNNING OFF AT THE KEYBOARD. I miss her so very much and look forward to future long discussions with her in the life to come! I have been looking into what was a well known New Age cult, The Holy Order of Mans (HOOM), its predecessor SCIENCE OF MAN Church, its reportedly Christian conversion successor CHRIST THE SAVIOR BROTHERHOOD and now find myself in some personal confusion as I am delving the subject for a local friend here in the Detroit area. It is reported that there may be at least remnants, if not wholesale, gnosticism remaining in this cult. ORTHODOXY AND THE RELIGION OF THE FUTURE by Fr. Seraphim Rose is one of the finest books I have ever read and I have recommended it to many. I have come across reports of a troubling doctrine, however, as well as evidence that the group has continued to stay in touch - both Christian and gnostic segments via internet communication lists of members together with Holy Order of Mans names and present names, addresses, and telephone numbers. That somebody would assemble such a directory is not in and of itself incriminating; HOWEVER, the same directories are obviously advocating the pre-conversion deeply gnostic practices of the group. Even among the claimed Christian converted segment of the order for which Fr. Seraphim Rose reportedly played a role in a mass conversion from New Age to Russian Orthodox Christianity, is a teaching of "aerial toll houses." I am researching this and will write more on it in the near future, but it appears to me to be a teaching where after death one goes to a series of "aerial toll houses" where judging is not by God but by demons. If the demonic inspection is not passed where good deeds outweigh bad deeds, the soul goes straight to hell. There is more, much more, but given my relatively uncritical endorsements of Fr. Seraphim Rose and his fruits, I wanted to make sure that ALL was tested for scriptural consistency. I certainly do not want anybody falling into this type of error on my personal account or because of anything I said or recommended. As always, "take the wheat, leave the chaff." I am not perfect. Fr. Seraphim Rose was not perfect and if he were here, I'm sure he would tell you that himself. As usual, you may download pdf (portable document file) versions of my books and research reference materials for free by clicking on this link or going to the "presentations for downloading" at the right of this blogspot. 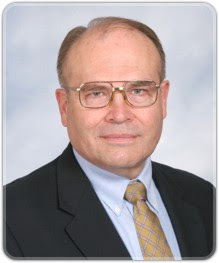 Dr. Grady S. McMurtry, MENSA member, former atheist and expert on Creationism is my guest on MY PERSPECTIVE TONIGHT! Tonight, 8 p.m. Eastern time, 5 p.m. Pacific time, the distinguished Dr. Grady S. McMurtry, will be my internet radio guest on MY PERSPECTIVE. As an atheist he rejected God. As he investigated and sought the truth, he found the evidence for God and his creation of our world and universe was unmistakable. He is a member of MENSA, a high-IQ required for entry organization. 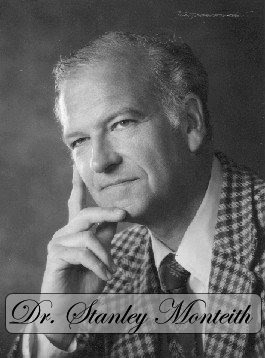 He has had a brilliant scientific career and an inspiring Christian one. 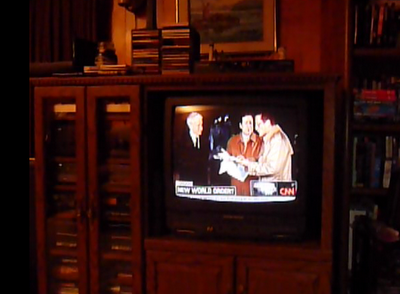 My profound thanks to Barbara Berry of Michigan for her assistance in procuring him as a radio guest tonight. He is globally sought after as a speaker. Listen in and stay tuned! Once there, click on the "chatroom" icon to join us there as well. Our Lord warned of the prophesied last days (Matthew 24) that there would be many earthquakes in various places. 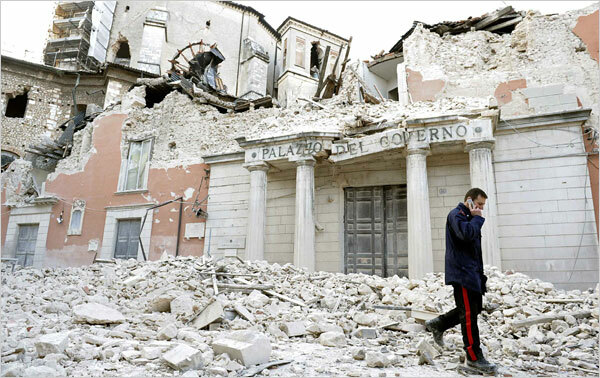 Sleepless in Michigan, I just learned that Italy only a few hours ago suffered a very brutal at least 6.3 earthquake which has toppled buildings and left thousands homeless. The New York Times story says 6.3 magnitude. The United States Geological Services says it was 6.7 magnitude. According to the New York Times account, "seismic activity is relatively common in Italy, but intensity like Monday’s quake is rare." I will be updating this as more news is available. Pray for those affected and if you can financially contribute to relief efforts for that region. You can read the New York Times account by clicking here. Are the prophesied "birth pangs" intensifying? It is my personal belief that this may well be the case. MAKING WOUNDED IN COMBAT AND OTHER VETERANS PAY FOR MORE FOR THEIR HEALTH CARE -- IS THIS FAIR? "And then Obama spoke eloquently of expanding veteran's health care, making military families a top priority. Wife Michelle even took time, he reminded, to "learn about the unique burdens" of his audience, and he garnered much applause while assuring pay raises and the ever-important "expanded counseling and outreach." I was impressed, truly, until I wasn't. For even as the president spoke, his budget was being prepared. And in Chapters 95 through 98 of OMB's Budget Options, Volume 1, Health Care, possible details of the Democrats' plans for the troops have been published. In the nutshell of my column space, I can't give many numbers. Rest assured they're ugly and undo years of promises and progress for military families. Most new guidelines would begin in 2011, conveniently after mid-term elections. If implemented, they'll hit hard. Option 95 is titled: Increase Health Care Cost Sharing for Family Members of Active-Duty Military Personnel. It's self-explanatory. Option 96 introduces punitive new co-pays and other out-of-pocket fees for our oldest, frailest veterans, the ones on a true fixed income. Members of TRICARE For Life, Obama plans to hold them responsible for their first $525 in medical costs and 50 percent of the next $4,725, indexed to increase with inflation. So much for their sacrifices and promises made. Option 97 will affect my family. It's entitled: Increase Medical Cost Sharing for Retirees Who are Not Yet Eligible for Medicare. These cost increases (doubling enrollment fees and raising co-pays and deductibles dramatically) would burden widows and orphans of KIAs, as well as former service members aged 38-65. This includes troops wounded severely in combat with limited access to VA care. Option 98, which I call Pay Again to Play, puts new fees on lower income vets, adding them to millions who already must give again to their government for once-promised health care. On page 189, the OMB bean counters recommend eliminating TRICARE For Life entirely. As hopeful hearts turn heavy, the writing is on the OMB Web site. Is the new administration calm on top, like a duck, pledging support? Will its feet slash and burn out of sight below, delivering promises to the wrong groups, while betraying our deserving troops? Patriots everywhere should be concerned. Call Congress. Write. Only a backlash will stop them from sliding these changes, and our military, under the door. Yes, complain about this one. The military families have suffered quite enough without these additional burdens. We owe them at a MINIMUM, decent health care! Ron Seigel's Perspective today and I mostly concur! PHOTO IS GLOBAL NEWS UPDATE TO THIS COLUMN OF DETROIT AREA LOCAL NEWS! As you know, I have a long time background in Michigan politics predating my writing of the Hidden Dangers of the Rainbow. I am acutely aware of the problems and sufferings of many Detroiters. Ron Seigel, a local political reporter and myself have sometimes discussed starting a separate blogspot to discuss Michigan governmental and political developments. Gwendolyn Mingo has been a guest on my radio program from time to time. She suffered immensely on a financial and personal level to seek honesty and fairness for her Detroit neighborhood that was intentionally neglected and then declared "blighted" by Detroit political and business officials in order to cheaply gain land for wealthy developers. I personally witnessed unbelievable tactics being leveled against Gwendolyn Mingo. Gwen was a highly respected professional and her husband was a high school principal. Her husband died an untimely death occasioned in no small part by stress over vicious maneuvers by those coveting a la Queen Jezebel and King Ahab coveting to take Nabob's vineyard. Ron Seigel has written me passionately to express his perspective on this and I thought I would be sharing it with you. Human greed being what it is, it can happen anywhere, especially as these wicked days advance. The biggest scandal in Detroit does not involve any of the scandals which made the national headlines, but something few in the media have paid any attention to. It involves atrocities against human rights which Americans have condemned in other countries. For over a generation the local governments in Detroit and many other American cities have forcibly expelled people from their homes, their neighborhoods and their communities. In Stalinist Russia this was done in the name of Communist Collectivism. In South Africa this was done in the name of Apartheid. In American cities, it is done in the name of “gentrification,” a sociological term which means removing people with less money in order to attract more affluent ones. While this is supposed to be done on the basis of income, it has often been done on the basis of race. Barbara Rose Collins, who heads the Detroit City Council’s committee dealing with development, publicly declared, “Urban renewal is Black removal.” Several years ago attorneys, who represented residents in Detroit’s Brush Park area, produced in court official city documents revealing the city was displacing African Americans in the area, while allowing Caucasians to stay. Gentrification has legally operated largely through the program of Urban renewal. Under urban renewal policies city government has been forcing residents to sell their homes. Once the government gets their land, it sells the land to developers, who build new houses at prices the residents cannot afford. On paper, the cities are legally obliged to relocate these residents into comparable housing as good or better than the ones they lost. However, the late Detroit City Council President Maryann Mahaffey declared that there was not enough housing in the city that they could afford. As a result, government has actually been creating homelessness. One woman, Jackie Green said, “We became homeless for a long time. You had to sleep here and there in empty houses.” The experience endangered her life and ruined her health. In discussing urban renewal, Father Norman Thomas of Detroit’s Sacred Heart Church declared, “This was the most terrible thing I have ever seen.” In the 1960s and 1970s residents of urban renewal areas were able to lobby their elected representatives on the city council to get some new housing built for them. However, last year city council members closed the door on this remedy. On July 29, 2008 six members of the city council voted to surrender their power to make decisions on city owned land and transferred their authority over to a land bank. Now whenever they are confronted with the refugees of their gentrification policies, city council members can always stare at the ceiling and piously note that the decision is out of their hands. While lavishing public money on organizations like the Economic Growth Corporation, which serves as lobbyists for big business (and may have An interest in promoting gentrification) the last two previous mayors Impounded all funds for citizen district councils established to represent and protect the rights of individuals and small businesses victimized by this forced expulsion. The citizen organizations, though, are continuing to work on sheer dedication without offices, staff, or compensation. Ironically, while the well funded big business oriented organization is called the Economic Growth Corporation, it is clear that since the time of its creation, the financial state of Detroit has drastically declined. In many ways the tactics of city officials toward critics of gentrification seem to be frighteningly similar to the practices of apartheid South Africa, the Soviet Union and the Mafia protection racket. Gwendolyn Mingo, who heads both the citizens district council representing Residents of Brush Park urban renewal area and the Coordinating Council For every citizen district council representing urban renewal areas in Detroit, ran into physical dangers after she spoke out against city practices. Last year some doubted it was a complete coincidence that a hit and run Driver just happened to ram Mingo’s car into a lamp post a week after she filed suit against urban renewal policies. In 2005 some doubted that contractors of the Detroit Economic Growth Growth Corporation were simply accident prone when they kept tearing up the gas main in front of Mingo’s house, creating a serious fire hazard for her and her family. Grass roots community leaders throughout Detroit held what they called a “vigil” in front of her house to prevent anything worse from happening. Some stated Mingo was facing harassment. Others considered it an attempted assassination. Ultimately the gas main was fixed, but other things have happened since in what seems to be at least a continuous war of nerves. I will discuss more of this in future articles. However, it seems clear to me that such things should not be happening in America.